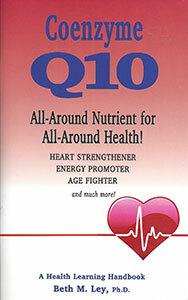 CoQ10 is found in every living cell. With age, insufficient levels become more common, putting us at serious risk of illness and disease. Thousands of scientific studies and clinical trials demonstrate that it can help: Protect and strengthen the cardiovascular system; and benefit blood pressure, congestive heart failure, cholesterol levels, adrenal fatigue, immunity, fatigue, weight problems, Alzheimer’s, Parkinson’s and Huntington’s Diseases, gum-disease and slow aging.